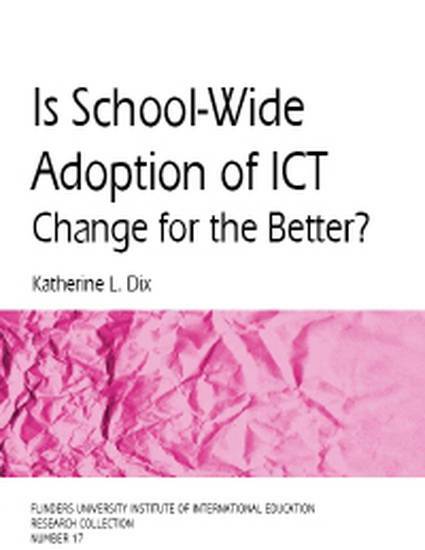 Is school-wide adoption of ICT change for the better? The use of information and communication technologies (ICT) in schools is now an intrinsic part of students learning, both inside and outside the classroom. The adoption and impact of ICT on teaching practice and learning outcomes has been a source of keen interest among government policy makers, school leaders, teachers and researchers worldwide. Research in this field has principally centred on pseudo-scientific comparative studies conducted mainly in the United States and the United Kingdom, with a focus on academic achievement. Few empirical studies have been conducted in Australia, or worldwide, that focus on student attitudinal outcomes framed within a design-based paradigm that spans several years. FUIIE Research Collection Number 17.